GroLogs are the master organizing structure in Botana. They are designed to be flexible to how you run your garden. Each day in a GroLog has a place for multiple photos, critical garden data, tasks, and observations. 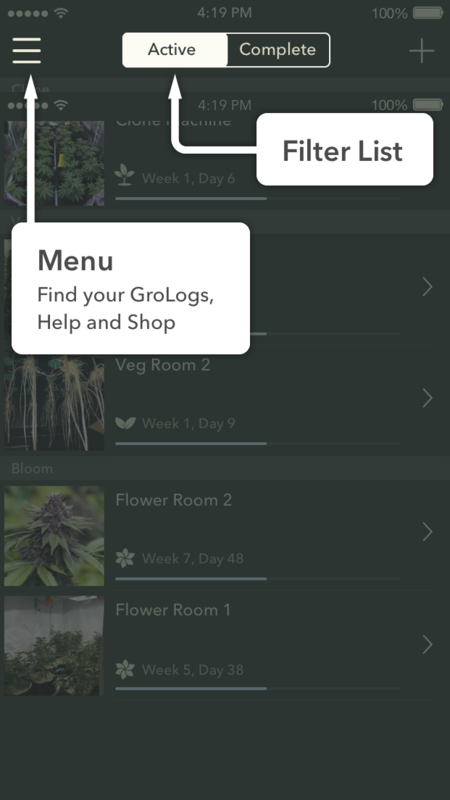 GroLogs can track 1 plant or 1000 plants. Manage multiple strains of a single strain. 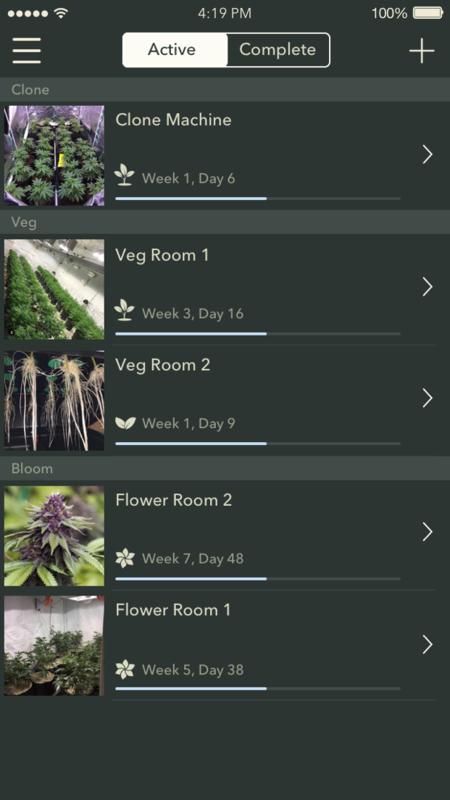 Transition GroLogs from one stage to the next (like, Clone > Veg) and pass important details. Currently you can share a single "DayLog" but not a complete GroLog (stay tuned). All you information is private and seen only by you. When you open Botana, the first thing you see is your garden overview, the GroLog List. If it's empty, you need to start a GroLog. This is the last image you took. If you see an image then open the GroLog and see nothing, don't worry... just take another image for today! The thin blue line shows how far along in a GroLog you are today. The text about shows the text version of your progress. The Active list contains GroLogs that are currently running or are scheduled to start in the future. The Complete list contains all GroLogs that you have closed, including transitioned to another stage. The name is most important. But don't overthink it. You likely already have a way of keeping track of your gardens and rooms. You can probably stick to that. Remember that a GroLog is a logical grouping of plants with the same environment and fertilizer inputs. It's crucial to keep this as a rule to allow for accurate Log-to-Log comparison and analysis later. You can see how flexible and easy GroLogs are to manage a simple or a complex operation. If you change your mind later, just edit your GroLog name. We will be adding more layers of specificity in later updates. We'd love to hear your ideas on how to make Botana smarter for your garden. You can create a GroLog for a future date. It will stay in the Active list, showing the upcoming start date. Starting a GroLog in advance allows you to set up a feeding schedule in advance. We are working on some amazing feeding recipe and other task features that will make planning ahead easy. This includes predicting and recommending when to perform certain tasks based on previous work. We'd love to hear your ideas on recipes and tasks. 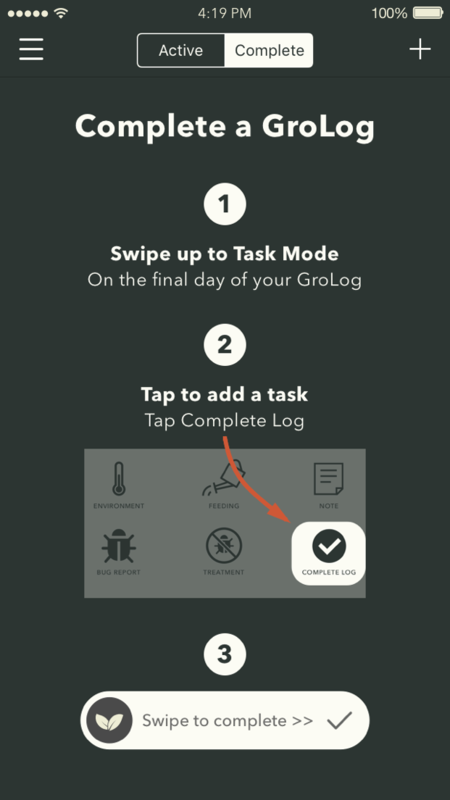 Check out this great article on deleting a GroLog and this one on completing and transitioning a GroLog.